Bring the beauty of mission style furniture to your bedroom with the Classic Siesta Mission Bedroom Set providing a king or queen size bed, one chest of drawers and one bedroom dresser. This solid wood bedroom furniture stands out as each piece showcases the straight angles and clean lines that help to define the beloved mission style. The Siesta Mission Bedroom set is available in your choice of rustic cherry, brown maple or oak wood. 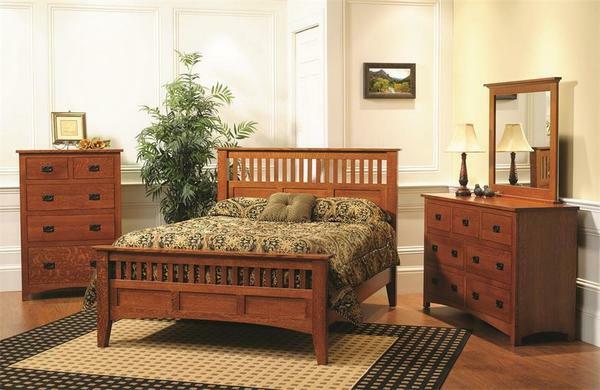 Select a queen or king sized mission bed that exhibits the beautiful mission slats that showcase your choice of solid wood. Keeping a simple design with little decoration allows all the solid wood counterparts to shine on this bed. This useful piece of bedroom furniture provides storage for your clothing or blankets. Display your favorite family photo on top. In addition to spacious storage, the Siesta Dresser offers a lovely surface to keep your jewelry box, perfumes and accessories on. Enjoy seven drawers or customize this mission dresser to provide more room with nine drawers featured in the taller option. Customize this mission bedroom set by adding a matching mirror for your dresser, nightstand(s) or armoire. Call us today, toll-free with any questions at 866-272-6773. We are happy to assist you. Shown in Quarter Sawn White Oak Wood with Micheal's Cherry Stain - Choose Oak for Closest Alternative for this Set.